The announcement was made by President Vladimir Putin, who has underlined the importance of using the lessons learned in Sochi to organize the tournament. Russian President Vladimir Putin has announced that Russia will spend more than 660 billion rubles ($15.5 billion) on the 2018 FIFA World Cup, to be held in Russia in four years. In turn, FIFA President Sepp Blatter declared the organization's unconditional support for Russia's efforts, assuring that any fears concerning the boycotting of the championship by European countries are groundless. "Russia will carry out all the work in the established period, and on the highest qualitative level," said Putin. The Russian president made the comments while chairing a meeting of the "Russia-2018 Autonomous Non-commercial Organization" on Oct. 28, which was attended by Blatter and key Russian ministers. The organization is responsible for supervising the preparation for the tournament. The Russian president said that soon the organizers would launch a special information web portal for verifying all the preparatory stages of the championship, similar to the one that successfully operated during the Sochi Olympics. "All the useful developments, ideas and practices must be fully utilized in the preparation for the World Cup," added Putin. "This concerns logistics, attracting volunteers, ticket programs and hospitality services for athletes and guests." The preparation for the championship, according to Putin, will cost 666 billion rubles (more than $15.5 billion). The money will first be used to develop the energy, information and transportation infrastructure. In the words of Russian Transportation Minister Maxim Sokolov, fans will be able to travel between cities hosting the matches free, just by showing their tickets. "By showing their ticket, fans will be able to transfer from one city to another by train," said Sokolov. "We have this experience with the railways. It will require approximately 2 billion rubles ($47 million) in subsidies." Putin also remarked that regional governments must now consider the expenditures related to using the legacy of the World Cup. "Regional heads must think in advance and calculate in their budgets the financing of children's and youth sports teams that will use the stadiums built for the championship," said Putin. FIFA President Sepp Blatter, in turn, announced his complete support for Russia and commented on the calls of several Western politicians to boycott the World Cup or deprive Russia of the right to hold the championship. "Football cannot be boycotted at all," Blatter announced. "FIFA strongly defends Russia holding the championship. This is a joint enterprise and not only for the Russian people, but also for the whole world. This is the biggest show in the world. Football unites people; it doesn't divide them." The 2018 World Cup will be held at 12 stadiums in 11 Russian cities. Three of the venues - the Otkrytie Arena in Moscow, the Kazan Arena and the Fisht Olympic Stadium in Sochi - are now ready. 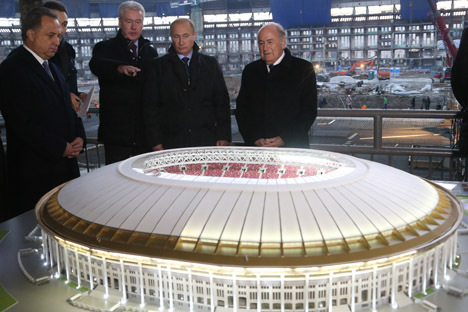 The final will be held in Moscow's Luzhniki Stadium, which is now undergoing reconstruction. Putin and Blatter visited the legendary arena with Moscow mayor Sergei Sobyanin, who thanked Blatter for managing to preserve the Luzhniki's historical appearance. "But inside everything will be super new, super modern," said Sobyanin. "Everything will be ready on time. This will be one of the best stadiums in the world." Russian Minister of Sport Vitaly Mutko believes, however, that Russia's main problem in preparing for the tournament is the insufficient number of hotels. "In most of the host cities we see a deficit in hospitality structures," said the minister. "We estimate that during the championship Russia will be visited by at least the same number of tourists who visited the 2014 World Cup in Brazil: 700,000 people." Based on material published by Kommersant and Rossiyskaya Gazeta.